Although light salmon in colour, this wine is not light on the flavour front. 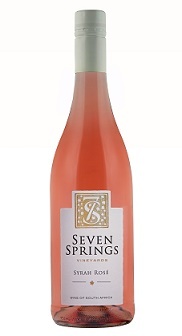 Flavours of watermelon, candy and grapefruit with a fresh yet elegant acidity. A wine that lingers and entices you to indulge in another sip. Also good to note that this wine is VEGAN FRIENDLY, as we used no animal or animal derived products in our production of this wine. In the midst of a 4 year drought, the hot and dry conditions prevailed throughout the season. Only infrequently did we enjoy a cool day and only at the end of November did we have a couple of weeks of rain to the benfit of the Syrah. Small berries and concentrated fruit characterised this season, giving us powerful and flavoursome wines. 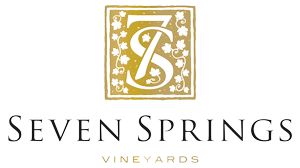 Picked early in the morning and transported to the new Seven Springs cellar, just 500m down the road, the grapes were stored in our cold room overnight. Sorting and elimination of any rotten berries as well as shrivelled raisins occur in the vineyards and then again on the sorting table. Our aim was to produce a light and bright rosé and therefore we picked it a few weeks before the main Syrah crop. This gave us a wine with red fruit flavours, lower alcohol levels and the light colour due to skin contact for just 9 hours. The juice was fermented in stainless steel tanks at a cool temperature, with time on the lees to create a little more texture and softer acid perception. It was just 5 months from picking to bottling.